We do it an average of 12 to 20 times per minute — often without even giving it a second thought. And yet, if we were to stop it for even a mere 4 to 6 minutes, not only would we be on the cusp of brain damage, but we probably wouldn’t be alive to finish reading this article. What is it that I’m talking about? Well, you can stop holding your breath…and breathe — because that’s what I’m talking about: BREATHING. We all know that breathing (air that is) is fundamental for our very existence. It supplies our body with the primary “food” of oxygen for each and every one of our 75 trillion cells. There’s no arguing the importance of breathing, we’ve all pretty much accepted it. What’s surprising, however, is that many of us are doing it wrong. A quick glance through an anatomy book will show you that we have many muscles that are associated with breathing — more that twenty. 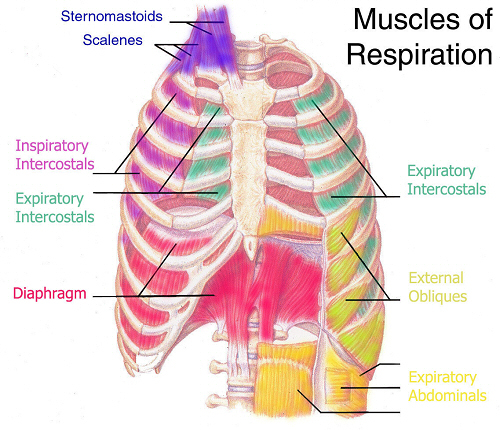 Most of these muscles, however, are designated as “accessory” breathing muscles (the scalenes are a good example). That is they are called upon when needed to assist the primary breathing muscles (namely the diaphragm, intercostals, and abdominal muscles) during times of increased demand, such as the heavy exertion of running, when the nervous system is stressed, or when we are thrown into a “fight or flight” situation. When they’re not lending a hand with breathing, many of these accessory breathing muscles have primary jobs of their own, such as turning and bending the neck, and almost all of them play a part in maintaining our body’s posture. So how is it that we are breathing wrong? It’s primarily and issue of “role reversal.” Instead of utilizing our primary breathing muscles and breathing from our bellies, we are calling upon many of our accessory breathing muscles to step in “full time,” and thus we end of breathing from our upper chests. This translates into very shallow breathing which is a very inefficient use of our lung capacity — about an 80% reduction. Consequently, we breathe more rapidly, as we do when we are under stress, and this in turn tenses our muscles and adds to our overall stress level. So, not only are we robing our bodies of sufficient oxygen, but we are also over-stressing our accessory breathing muscles, which, from a chiropractic perspective, will have an adverse effect on our posture and the tension it places on our spine, muscles, and nervous system. Ultimately, faulty breathing patterns such as this can be the generation point of many chronic, painful musculoskeletal problems. Calling upon our accessory muscles to step in for our primary breathing muscles is a lot like relying on that thin spare tire that most of us have in our cars as one of tires we would use everyday — it’s just not fit for the job. You may be wondering what causes this “role reversal” and if there’s anything you can do about it. As for the cause, I haven’t come across a solid connection in my readings; however, most authors tend to link it with a major stressful event or injury — some even from the birth process itself. Having the “wind knocked out of you,” as one author stated, can disrupt your breathing rhythm and may end up manifesting itself as a restriction of breathing that is programmed into your nerves and muscles. Other authors have made mention of the typical upper chest breathing patterns that were seen in mid-19th century women because of the corsets on the lower part of the chest that were worn. Perhaps tight, restrictive clothing is still a culprit in today’s age. Regardless our particular cause, we can “teach” ourselves to breathe correctly. It may not come easily at first, but with patience and persistence the benefits will definitely be worth it. Not only will you reduce your stress, muscle tension, pain, and poor posture, but, more importantly, you will be feeding your body more air! In essence you will be giving your body more life! Before I teach you the exercise that will help you train yourself to breathe correctly, you need to know intellectually how proper breathing works. Your lungs, which contain no muscle, sit inside of the chest cavity. At the bottom of the cavity is a large, dome-shaped muscle known as the diaphragm (your primary breathing muscle). When you breathe in, the diaphragm is pulled down. While this is happening your stomach and other digestive organs have to make room by also moving down, and this is allowed to happen by your abdominal muscles moving out. So in other words, when breathing in your belly goes out and diaphragm and internal organs go down. This in turn creates a negative pressure gradient in the chest cavity (ie. a vacuum), and the lungs fill with air. The reverse happens when you breathe out. Unlike the breathing described above, this type of breathing allows the lower parts of the lung to swell, giving a fill of about 80% — enough for your body to sustain itself during normal circumstances. It is only during times of stress and exertion that you need to call upon the help of your accessory breathing muscles to kick in that extra 20% from your upper lungs, enabling your body to receive the oxygen it needs for these special circumstances. Okay, with Breathing 101 now in your brain, let’s put it into practice. The following exercise comes from Fit for Life II: Living Health by Harvey and Marilyn Diamond. Aren’t quite sure whether you’re breathing correctly or not? Try the exercise for your answer. “This can be done either sitting or lying down. If you practice it sitting, you should keep your spine erect, so sit in a chair with a straight back or cross-legged on the floor with you back against the wall. Place your hands on your abdomen, one above the navel and one on it, as you breathe in. Feel the navel swell out first, and then feel the breath slowly rise up into the chest. As you breathe out, the hand positioned above the navel will ‘sink in,’ followed by the lower hand. In this way, you can actually feel the abdominal breathing taking place. Breathe comfortably like this for at least two minutes, and gradually work the exercise up to five minutes a day. As you breathe in, count to four, hold for two, and then release the breath for four counts. “A second way to practice this exercise is to lie on your back on the floor, and this works particularly well if you have bad posture, a lot of tension and stress, or have been through some shock or developed some fear that keeps your breath ‘locked’ in your chest. Roll a bath towel up the long way and place it under your spine from your waist to the top of your head. This will force your chest to press up and expand as you lie on the towel. This position will also automatically pull the breath down into the abdomen. Place your hands on your stomach as indicated above, and breathe slowly and comfortably for two minutes; work up to five minutes if you can. The above-mentioned authors contend that this is by far the most powerful deep abdominal breathing exercise that you can practice. Need some help? Your local chiropractor can assist you in evaluating and retraining your breathing patterns. In addition, he or she can set up a program with may include specific spinal adjustments, muscle techniques, and exercises to help you reverse the physical stresses that improper breathing can bring about. And with that, we can all breathe a little easier. Diamond. Fit for life II: Living health. Warner Books. New York. 1987. Hafen and Karren. Prehospital emergency care & crisis intervention. 4th ed. Brady/Morton Series. Englewood Cliffs, New Jersey. 1992. Kendall, et. al. Muscles: Testing and function with posture and pain. 4th ed. William and Wilkins. Baltimore. 1993. Weil. Natural health, natural medicine. Houghton Mifflin Company. Boston. 1998. This entry was posted on December 11, 2009 at 2:00 am and is filed under exercise, healthy living, whole body health. You can subscribe via RSS 2.0 feed to this post's comments.